There is no way I could let this week pass without paying homage to an extraordinary young lady, one whose talent and triumph embodies the very spirit of the Olympiad. Yes, I speak of Ms. Gabrielle Christina Victory “Gabby” Douglas, the 16-year old athlete who re-wrote U.S. Olympic history last week by becoming the first African-American to become Olympic all-around champion in gymnastics. Additionally, she is the first American gymnast to win gold in both the team and individual all-around competitions during the same Olympics. To watch this young lady in action is to watch beauty, style, grace and athleticism. At the heart of her success is her family support. Her mother, Natalie Hawkins, has been seen in the stands cheering her on, along with her sister Arielle, a former gymnast, who convinced their mother to enroll Gabby in gymnastics training at an early age. Also in Gabby’s corner, though not as much in the spotlight, is her father, Timothy Douglas, who is currently on military service in Afghanistan. It was noted that they are both dedicated to representing their countries, albeit for different reasons. But what does this have to do with motherhood? This historic feat is clearly a teachable moment for our African-American daughters, our daughters, nay, our children. When watching the highlights of Gabby’s gold medal win the morning after, I explained to my children who she was and the significance of her victory. My 4-year old daughter was entranced by Gabby’s tumbling and flying prowess and said, “Wow, I wish I could do that!” I immediately sprang into Mommie mode, using this opportunity for a teachable moment. I explained to BOTH my children that you could do ANYTHING that you wanted to do, as long as you were willing to work hard for it. It seems the last historic teachable moment of such high magnitude was with my son on the day Barack Obama was elected the first African-American President of the United States. I intentionally corrected my earlier statement – the Olympic Games, and sports in general, have always been about the thrill of victory and the agony of defeat. Lessons in triumph and tragedy transcend gender, race and nationality. So Gabby’s victory is a victory for all of us. On the other hand, as a mother of an African-American little girl, it is significant that my daughter be able to have an additional identifier to this young athlete. Here’s a young lady who looks like me and look what she has accomplished. Sorry, but I can’t overlook this point. Will Yvette be a future Olympic gold medalist? 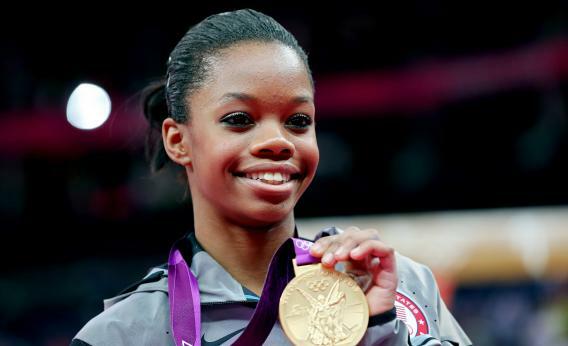 I don’t know, but Ms. Gabrielle “Gabby” Douglas has shown us that anything is possible. Congratulations Gabby on a job well done. I think we ALL felt like your “Mommies” last week!